With the professional waterproof Shark you benefit from the newest technology LED light. You can select the mode for 2 conventional 5mm LEDs or select for the powerful 1W LED for a super high beam of light visible for 10 Kilometres. This is the world’s first waterproof dynamo flashlight/charger. The Shark comes with a DC-charger, standard Nokia cable and 7 adapter tips, which cover 90% of all mobile phones. Recharge the Shark with the DC charger or use the dynamo generator for powerful light anytime you need it. Buying this product will earn 366 Loyalty Points. 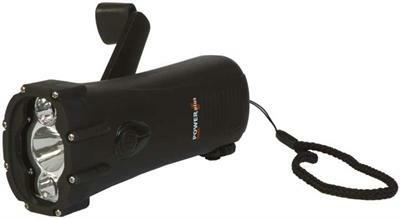 Be the first to submit a review for the PowerPlus Shark Waterproof Wind-up Torch.